If you’re looking for a spray to terminate insects upon contact, then our aerosol sprays and foggers are great solutions for you. These products are ideal for use in outdoor storage sheds, warehouses, and other areas where food isn’t being handled. However, if you operate a restaurant, concession stand, or other foodservice establishment, then our crawling insect control traps are better options for you. These glue boards trap insects on their sticky surfaces and contain no poison. By keeping pests away with crawling insect killer, you’ll be one step closer to maintaining a safe and sanitary environment. Not only will you be following health code requirements, but you’ll also be making your working or dining area more comfortable and welcoming. Stock up on these products, and always be prepared for any outbreak! Be sure to also supply your staff with disposable gloves to clean up used traps. Our push brooms and dustpans will also help you pick up traps from your establishment’s floors. 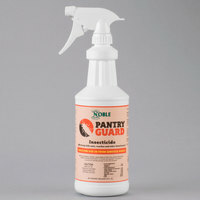 If you're wondering where to buy noble eco crawling insect control products, we have a large selection of noble eco crawling insect control products for sale at the lowest prices.